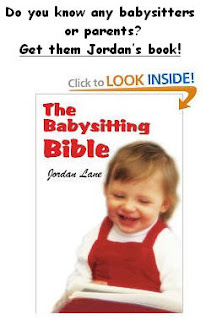 Email Marketing: Knowledge, Best Practices & Tips: Jordan Lane's Post Featured in September 2009 Cheetah Spots! 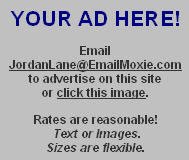 Jordan Lane's Post Featured in September 2009 Cheetah Spots! Jordan Lane's post, Is Share-With-Your-Network Killing Forward-To-A-Friend?, is featured in Experian-CheetahMail's September 2009 Newsletter, Cheetah Spots! Click here to read the Is Share-With-Your-Network Killing Forward-To-A-Friend? post on EmailMoxie.com. Click here to view the September 2009 Cheetah Spots. Here is an excerpt from the first paragraph of the post. 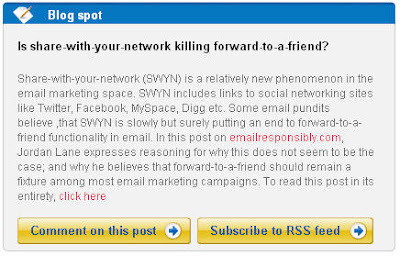 "Share-with-your-network (SWYN) is a relatively new phenomenon in the email marketing space. SWYN includes social networking sites like Twitter, Facebook, MySpace, Digg etc. Some email pundits believe that SWYN is slowly but surely putting an end to forward-to-a-friend (FTAF) functionality in email. I don't believe this is the case." Click here to read the entire post Is Share-With-Your-Network Killing Forward-To-A-Friend? 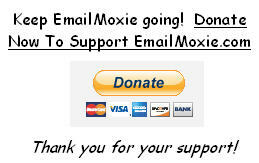 on EmailMoxie.com. Are You An Email Addict? HUGE EMAIL VIRUS IS COMING! Yeah, Right.